If you’re a serious coffee fan then Bodum may ring a bell to you. Bodum has been famous for decades due to their fantastic press pot coffee machines. They are also well known for their fresh sense of style which is hard to mimic. Although they are famous for regular coffee press pot machines you may not think of espresso where they are concerned. Today all that has changed, with the Bodum Granos, a fully automatic machine that will brew to a specified volume with the press of a button. Bodum first announced their press pot espresso machine at the SCAA conference in Atlanta and then next year at Seattle the coffee maker had grown popular. The Bodum Granos ships with quite a lot of goodies. It comes with a full color instruction manual, single filter basket, double filter basket, pod filter basket, water bottle intake spout, measuring spoon and plenty more you would receive with an espresso machine. The manual is easy to read with everything being visual. There are many demonstrative color photographs which add an artful touch. This colorful manual shows you how to program the machine, access the functionality of hot water, how to steam, brew and the many other operations it supports. The Bodum Granos’s base is very wide and low but the drip tray is deep. The drip tray is massive and heavy plus is actually is so deep that it sits on the table. This extremely wide drip tray is to compensate for the machines pressure relief system that is not so good when a shot is brewed. On the far left on the top of the machine sits a curved arm like connection that attaches the base to the brewing head and the electronics. This is just an example of Bodum’s unique design that on other espresso machines never looks quite the same. The top of the Bodum Granos has all the electronic controls and components. This is also where the brew head and boiler are located. On the top right side of the espresso machine is the water reservoir. It features a vertical water reservoir with also the option to use bottled water instead. There is an adapter cap and even a separate drip tray portion for this. The adapter can accommodate many types of bottles with no problem. The three types of filter baskets, single, double and pod are all pressurized. The wand used for steaming comes with the common froth aider but also has the option to be removed to make a more traditional froth. One peculiarity is that the froth wand does not point toward the drip tray no matter which direction it’s pointed, which is sort of strange given how large the drip tray is. Overall, the Bodum Granos Espresso Machine is a high-class, stylish, and easy to use espresso machine for the serious espresso lover. 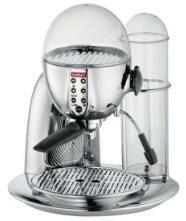 You can get a great deal on the Bodum Granos Automatic Espresso Machine here.